Therapeutic Touch® is a holistic, evidence-based therapy that incorporates the intentional and compassionate use of universal energy to promote balance and well-being. Therapeutic Touch practitioners are educated to modify a person’s energy field when disease or illness obstructs or depletes their flow of energy. The Therapeutic Touch treatment restores order and harmony to the client’s field. Based on the belief that the body can heal itself, Therapeutic Touch is a method of helping a person to mobilize their own natural healing abilities. Check out the evidence on the research page. What is the origin of Therapeutic Touch? 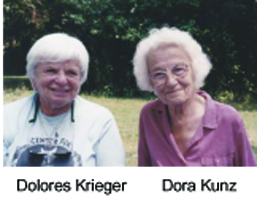 Therapeutic Touch was developed in the early 1970s by Dolores Krieger, PhD, RN, professor emeritus of Nursing at New York University, and Dora Kunz, a gifted, naturally clairvoyant healer. Together, they standardized a technique that has been referred to as a contemporary interpretation of several ancient laying-on-of-hands healing practices. 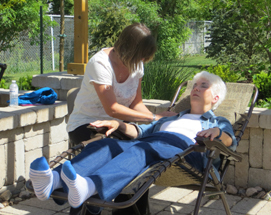 Therapeutic Touch has grown in popularity and is now taught and practiced throughout the world, including numerous universities and colleges in Canada and in the United States. What are the benefits of a Therapeutic Touch session? Research has shown that Therapeutic Touch® (TT) is helpful for people who are ill or in pain. Results show that it promotes a relaxation response, reduces anxiety, and improves sleep. TT facilitates the body’s natural restorative process, bringing about an improved sense of well-being. If you ask someone who has just experienced a Therapeutic Touch session, they are likely to say they feel more relaxed, are experiencing less pain, and are generally more comfortable. Has any of this been scientifically proven? Therapeutic Touch is accepted as an evidence-based modality since each possible outcome that is reported about it has been proven in research. In fact, Therapeutic Touch has more research documentation than any other healing modality being used today. That came about because Dr. Krieger, a former professor of nursing at NYU, taught Therapeutic Touch to her students. Her graduate students often chose to explore this modality in their Master's thesis. Later on many of them earned their PhD in a similar way. Today, most of the research on Therapeutic Touch is being done by those outside the "family". For instance Dr. Marilyn Schlitz, when she was Research Chair of The Institute for Noetic Sciences - IONS - proved that by one's intention a person can change living tissue at a distance. Several years ago Dr. Schlitz spoke at one of our many TTNO Conferences. In the early years three research pieces brought Therapeutic Touch to the attention of the medical world and the media. In 1974 Dr. Krieger proved that Therapeutic Touch could increases hemoglobin levels. In 1979 Dr. Patricia Heidt showed that it produces a state of psychological relaxation; a relaxation response. And in 1982 Dr. Janet Quinn replicated that research making sure that the nurse/practitioners involved did not touch the patients. She obtained the same result, as was noted by the New York Times in September, 1985 in a article entitled, "Laying on of hands gains new respect". For a complete list of Therapeutic Touch research go to Research at a Glance. What is The Therapeutic Touch Network Ontario (TTNO)? The TTNO is a nationally registered organization whose mission is to promote the practice and acceptance of Therapeutic Touch®, a non-invasive energy healing modality. Its elected volunteer Board works to create a safe place where people can find workshops in which to learn Therapeutic Touch, develop standards for those practitioners, and hold gatherings where they can network with other practitioners. The TTNO also produces a quarterly newsletter to further advance their mission. If you are interested in becoming a member, click here. Who can learn to do Therapeutic Touch? Anyone with the intent to help or heal has a natural potential to learn Therapeutic Touch. It is a skill that requires sensitivity and needs to be practised initially with supervision and feedback. If you have an open mind and a caring heart, this healing modality may be a good fit for you. Find a Recognized Teacher in your area. What is involved in learning Therapeutic Touch? Recognized Teachers of The Therapeutic Touch Network of Ontario (TTNO) provide workshops that are available privately and through health care facilities and community colleges. The basic training consists of three levels, each a minimum of eight hours, taken over at least a six-month period. Following the basic levels, students are encouraged to study with a variety of teachers, each of whom brings his or her own experience into the teaching. The TTNO has developed both standards for practice and curriculum guidelines for Recognized Practitioner (RP) status. For example, to achieve RP status, practitioners must complete a workbook with 75 case studies, detailing sessions they have given and received. Those students who meet the established criteria are granted the status of Recognized Practitioner and with further study, Recognized Teacher. In both cases, status is renewed annually on evidence of continuing education. Competency as a practitioner is gained through practice and continued study, as well as participation in Practice Groups, retreats, workshops and conferences. Therapeutic Touch is practised all over the world. It is perceived to be on the leading edge of 21st century vibrational medicine and is creating a global impact by profoundly enhancing the quality of nurturing care from birth to death. For a list of other Therapeutic Touch organizations around the word go to the Links page in the Therapeutic Touch section of this website. A Therapeutic Touch session is always individualized. The client remains fully clothed and the session can be offered while the client is in a sitting or lying down position. Every client has their own experience, but research and anecdotal reports show that the majority of clients feel relaxed and any symptoms of anxiety or stress are diminished. There is often a change in the perception of pain—it is reduced or made manageable and often clients fall asleep. How do I arrange for a session? Are there Therapeutic Touch practitioners in my area? The Find Practitioners section of this website provides a list of Recognized Practitioners and Teachers across Ontario who have given permission to be contacted for Therapeutic Touch sessions. There is also a Referral Service to reach those Therapeutic Touch practitioners who are willing to give sessions in various hospitals or in a person's home. How is Therapeutic Touch different from Reiki and other complementary healing modalities? Reiki and other complementary healing modalities are usually energy-based and the practitioner would be working with the client’s energy field. Therapeutic Touch has one lineage worldwide which means it will be recognizable on every continent. Reiki now has over 20 different styles. Having only one lineage made it possible for a large amount of research to be developed on Therapeutic Touch. For this reason TT has the strongest research base of any of the energy therapies. This makes it the most accepted therapy in clinical practice.